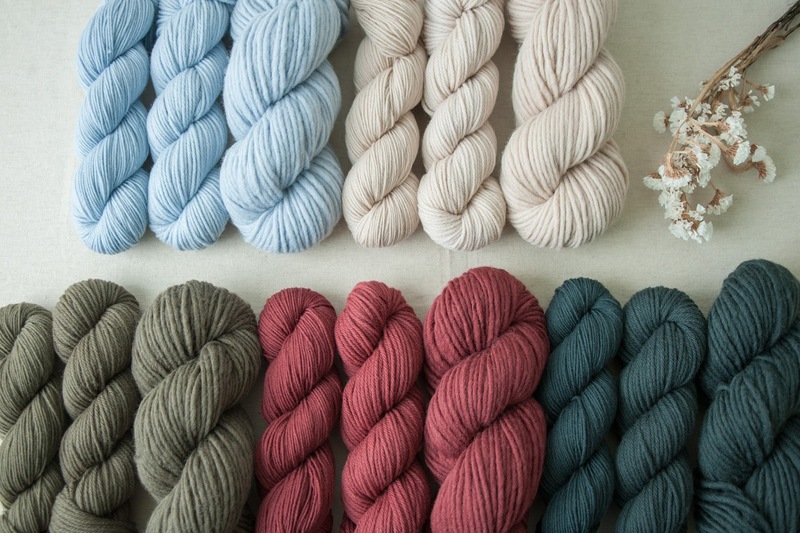 At Quince & Co the late February forecast: Pale winter skies and warm, cozy knitting. Two beautiful new blue heathers have arrived for our chunky-weight Puffin! Similar to our natural heathers but with just a smidge of soft blue, these wooly one-off shades of Puffin are in very limited supply, available online exclusively at Quince & Co.
At Knitcircus Yarns Skating Party Kits are back in stock! A fun, achievable colorwork project that makes a gradient and semi-solid look stunning, Skating Party kits have been flying off the shelves. Now freshly dyed in the original Cindy Lou Who gradient, you can also snap it up in Mermaid Lagoon, Vampire Boyfriend or April Skies. 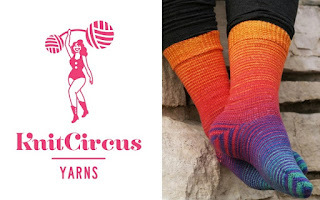 Find at www.knitcircus.com and be sure to join our Ravelry group. Knitting Pipeline is a Craftsy Affiliate. Craftsy offers affordable online classes that are yours forever. Take advantage of $4.99 flat rate shipping in the US and free shipping for orders over $99 when ordering supplies. When you use the link in the sidebar on my blog before purchasing a class or supplies I receive a small percentage of your purchase at no extra cost to you. Thank you! Thanks to everyone who has been in touch with me in the past few weeks and for your feedback on the last episode. A special thank you and welcome to new Pipeliners who have introduced yourselves in the Welcome Thread. LeighT from New Jersey, Francesca from Manchester UK, Saraquatique from Montreal Quebec, Mockcable who is Lydia from NH, gKirchmar who is Gayle from DC, CherylLb1262 who is Cheryl in Columbus OH, Snoozann who is Suzanne from TN, Photokiss who is Kristi from NM, Alsoadie who is Adrienne from MD, birchpoint who is Elizabeth, JoanBry (friend of SeashoreSharon), BantersWhim who is Dee from Rocky Mount, MC, Olivia who is okthread from NY NY, and amsie who is Amy. Thank you for the reviews and 5 star ratings on iTunes! I just thought of another tip to keep on knitting. I’ll yank out the yarn from my center pull ball an arbitrary number of times, then lay that yarn beside me and knit until I have a tidy cake of yarn again. My mom taught me that trick, only she would use a pan of brownies. Oops, we have to neaten up this edge, it’s all crumbly. Till, you guessed it, no more brownies…..I mean wip. I have tried the Norwegian Purl and it does seem like a lot of gymnastics to me. A bit convoluted. It is recommended as a way for Continental knitters to have a tighter purl stitch. I believe I have solved the rowing out for myself without going to Norwegian Purl. I am fascinated by all the different ways people execute stitches. At the retreat this past weekend I observed a lot of people, especially my fellow continental knitters. I know continental knitters who are not tight knitters and those who are. Some use their thumb on the left hand in executing purl. Some throw the purl and pick the knits. Remember that speed isn’t everything. If you enjoy the method you use then that is fine. My question….about your working to improve your purling continental. My purling is most always looser than my knit stitches. I have used interchangeable needles and used a smaller size needle on the needle that I purl with. What I would really Like to do is find a way to tighten my purl to help my gauge. You commented about “observing the angle of the needle and thread as the needle exits the stitch” or something like that. I can’t figure it out. Can you help me a bit with this. I'll link to BlueBeeStudio's tutorial. TheWoolenfog who is Linda from Kennebunk ME! Congratulations! 2 skeins of Blacker Yarns Tamar is on it's way to you! Linda wrote: I would love to knit a warm shawl with this yarn, something with stitch definition. I enjoyed this episode, Paula. I watched yesterday, the same day I received the KnitPro set of dpns and the interchangeable circulars set from Claire at the Woolly Thistle! When you mentioned them in your needle organization video I was sold. I like these very much. They came very quickly, the price was excellent and the quality seems very good! To rev up our nordic engines I am hosting an informal Icelandic Read Along/Knit Along in the Knitting Pipeline Group on Ravelry and on the Knitting Pipeline Podcast. The idea is to share literature, books, authors, and of course, knitting about Iceland. You can read anything about Iceland including travel books, Icelandic authors, and of course, classic Icelandic literature. You may already know that the Icelandic sagas are central to understanding the culture of Iceland. Since these are well into the public domain (12th century) they are usually free or nearly free in digital format. Njal’s Saga or Egil’s Saga are often considered a good first plunge. I’m starting the Read Along with the 1955 Nobel Prize winning novel: Independent People by Halldor Laxness. Quite honestly, I don’t know why I haven’t read this before. Could we go wrong with a main character who is a sheep farmer? I hope you join me in the Icelandic Read Along/Knit Along. You might think of June as the month of light since the days are longest here in the Northern Hemisphere; however, I think of February as the month of light for during the shortest month of the year we see the light changing rapidly. It is most obvious in the evening when suddenly it seems it is no longer dark at 5 PM, then at 5:30, and finally now at 6 PM. It can throw you off a bit. We are also currently having a February thaw which while not unusual for a day or even a few days, this one is lasting over a week. At the retreat this past weekend it was so warm we barely needed a shawl, let alone a winter coat! A few weeks ago I noted that the bird song has shifted from call notes to mating songs. We hear the chickadees whose long whistle seems to belie its small size. This morning I heard the call of the Redwing blackbird, and sure enough, I then spotted a small migrating flock at the top of a stand of oaks. It is busy at the feeders today with nuthatches, downy woodpeckers, tufted titmouse, cardinals, and red bellied woodpeckers. The cardinals are still showing up in flocks in the late afternoon but these will soon be breaking up as they establish territories and find their mates. On a snowy day two weeks ago I was on my way home from errands and suddenly my eye was drawn to a shape in the upper branches of a large tree that stand in front of a farmhouse not too far from our home. It was snowing big wet flakes. Closer inspection confirmed my initial recognition—it was a mature American bald eagle, hunched over in the falling wet snow. I did get a poor photo with my phone and considered going home to get my camera since eagles will often stay in the same place for some time. Usually we see bald eagles nearer the Illinois River which is only a few miles from us so this was unusual. I know it's a terrible photo but that dot up there is a mature American Bald Eagle! And willow stems grow daily red and bright. And prayer to purify the new year's will." Wearing my Vintage Fairy Lights by Helen Stewart today. In Threes by Kelly Herdrich aka Kelly without a Net. Realized that when I purl there is some slippage with the yarn because I flick the yarn for purl. I started wrapping around my little finger in the left hand as opposed to over under over. Books! My husband got me a new iPod Touch for Valentine’s Day! · The Pecan Man by Cassie Dandridge Selleck. Book cover looks like our old house! Retreat! Thank all, especially Bronwyn and Sarah. Nikki and volunteers. Breakout session teachers. Klose Knit, 311 W. Springfield Ave. Urbana Illinois 61801 (across from Strawberry Fields) (217) 344-2123. If you are coming in on I-74 this is a perfect place to stop for a break as well as coffee or lunch. Exit Lincoln Ave, Left on Springfield Ave, the shop (white house) is 3 blocks down on your right. Early opening at 9 AM Fri for yarn crawl. Le Mouton Rouge Knittery, 1206 Towanda Ave, Bloomington IL 61701. Visit this full service yarn shop with convenient access from I-39, I-55, and I-74. It is just off Veteran's Parkway. Open early at 9 AM on Friday. Ewe-nique Yarns, 110 E Queenwood Rd, Morton IL 61550 (309) 266-9398. They are opening early at 9 AM on Friday so feel free to head on over while we set up at the church. Have a great week, haste ye back and hold your knitting close.